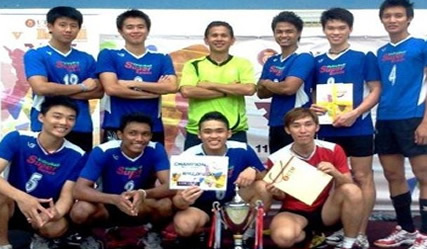 BANGI, 21 May 2012 – The UKM volley ball team has for the third consecutive time emerged champion in the recently concluded Volley Ball International Invitational Championship held at the Universiti Teknologi Malaysia campus in Scudai, Johore. A total of 16 teams including from Singapore, Thailand and Indonesia took part in the three day competition. The UKM team was given the honour to keep the challenge trophy following its third consecutive win. The UKM team was led by third year Social Science and Humanities student, Luk Teck Liong. The team was trained by its coach, Major Mohd Jasmy Abd Rahman with Mohd Hafizan Hashim as manager. The team looks at its participation in the invitational as its final preparations for the National Volley Ball League competition to be held from this Saturday, 26 May in Malacca. The national league competition will end on June 17 at the MPSJ Stadium in Serdang. The team is hopeful of winning the championship this time around following its narrow 2 – 3 defeat at the hands of the Bukit Jalil Sports School team in the final last year at the Badminton Stadium Cheras.